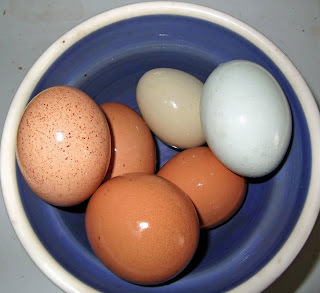 These are the eggs I gathered this morning - just before the Barn Man again scared me half to death. 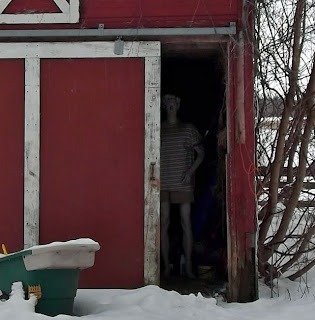 I think the Barn Man is going to have to move again. Maybe I'll take him up to the store and let him scare the people in Hamburg! Eggs look yummy! I miss fresh eggs. I just smiled when I saw your man in the barn. When we lived in MO, my "bug man" would put manaquins in the ditch at the corner of where to turn to go to his house. We never got lost. Eggs look beautiful and I know taste so much better than in the store. THAT is so funny! I get scared every time I visit my SIL. She has a full-size cardboard cut-out of John Wayne as you come in the front door!